Breakaway, a photo by Robin Nystrom on Flickr. 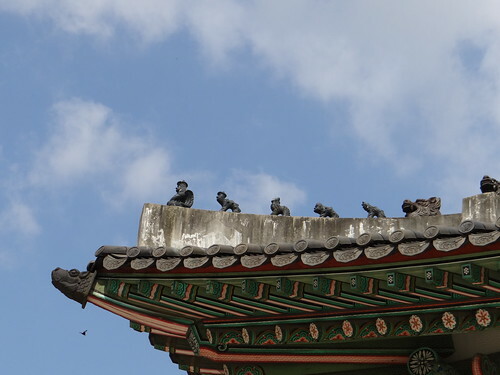 The carefully placed clay figures that ornament the rooflines of palaces around Seoul are known as japsang (잡상). Once the storm passed, the rest of my stay in Seoul was blessed with gorgeous sunny weather. I took advantage of it to stroll along the Han river, like many other Seoulites (me being a temporary one). Bicyclists whizzed up and down the path in droves. I also sprang for a short river tour too. Along the way I couldn’t help but try and spot a favorite police sergeant and a female embassy staffer who just happened to be the president’s daughter*, or some heated exchange between some individuals in their car, parked under a bridge along the river**, but to no avail. Just a nice day, nothing exciting. * You know I’m talking about our protagonists from “Lovers in Prague,” right? Strolling through the homes and demonstration fields you have a chance to examine the many styles of homes to be found throughout the country. The level of authenticity is such that portions of the village are used in filming historical dramas and movies. The best part for many are the different performances staged throughout the day, ranging from traditional music and dance to horseback riding, to demonstrations of traditional crafts, done with a high level of enthusiasm and professionalism. The highlight for me was the acrobatic performance on a tightrope, such as the one seen in the movie, “The King’s Man” (aka “The King and the Clown”), starring Lee Junki, Kam Woo Sung, and Jung Jin Young. The single performer managed to keep his balance, narrate his actions, and barely break a sweat! It was highly entertaining, even without understanding most of what he was saying. His balance and showmanship spoke for him! Yesterday was one of those weird weather days in Seoul but that doesn’t deter the dedicated traveler. Thousands and thousands of Koreans took to the roads, buses, and trains to make their way back to their hometowns to celebrate Chuseok with their families, coping with long delays and flooded streets. With the seasonal exodus, many parts of Seoul were a lot less crowded, leaving the way free and clear for the intrepid. The day began with occasional drizzles so a walking tour of Bukcheon (North Village), a historic part of Seoul where the traditional style of homes known as hanok still survive and are being lovingly maintained and restored. 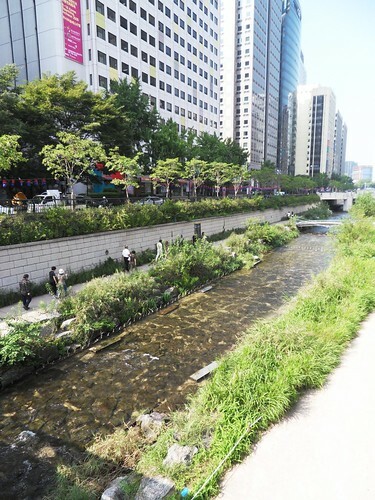 I’d registered for a guided walking tour of the area through the Korea Tourist Organization and expected to join a few other like-minded explorers. To my surprise, I was the sole participant and was grateful to learn that neither this nor the weather discouraged my guide and the tour was on! Kim Sang-jin sshi and I began with a tour of Unhyeongung (Unhyeong Palace) and proceeded from there through the back streets, up and down the steep hills of Bukcheon. We finished our tour and spent a pleasant hour over coffee taking refuge from the increasing rain, talking about our mutual love of travel and exploration. We parted and so did the skies, with rain coming down in heavier and heavier waves. Tired and drenched, I opted for a taxi back to the hotel, rather than make the longer walk in my squishy shoes. A wise decision! If you have the chance to visit Seoul, make a point to wander Bukcheon and maybe, just maybe, stay in a hanok. A number of guesthouses are available, ranging in price from very reasonable to high end and they offer a chance to experience a very different way of life. While Seoul has a fabulous metro and bus system, it never fails that I end up walking miles while I’m here because the station to this place or that is just a little shorter (I think) than my ultimate destination. Yesterday was one of those days where I took bus number “11*” much of the day – wandering first around Cheongyecheon, then through the immense Gyeongbukgung, then the cable car and hike up to the North Tower observatory on Namsan. Along the way I saw families and friends delighting in the warm sunny Saturday weather and many tourists. And once again I am left to wonder why it is that Taiwanese tourists (judging by their accents) want to have me pose with them in their photos. Somewhere I figure in the souvenir photos of the Blue House (the official residence of the Korean president) of several charming young women. I repay the favor by taking their photos, and those of interesting people I see, like these two skater boys – actually a Korean “mobile” police team, on rollerblades, stationed in front of the Blue House. So I flagged down a taxi to take me to the elevator that leads up to the cable car and joined the throngs up the mountain. Squished into the car was not like the experience of many a drama character (who inevitably have it to themselves, or darn close! ), but it’s an impressive view and much easier than letting the 11 bus take me up the long hike that many more athletic types take as a form of exercise. Maybe if I lived here… At the top I enjoyed the view and imagined the view of the watchers who manned the signal beacons years ago. On a clear day you can see for miles around. On a more sentimental slant, I enjoyed looking over the many “locks of love” left by young lovers over the years. The 11 bus was close to breakdown after the trek back down the mountain so she hopped a taxi back to the hotel and took a brief rest and enjoyed some television (“We Got Married” live and unsubbed!) before taking yet another stroll – this time to the Gangnam CGV to take in a movie, “Cyrano’s Dating Agency” or 시라노 연애조 작단. Even without captions the comedy sparkled and gave the 11 bus energy enough to stroll back to the hotel, to shower and collapse gratefully into bed!